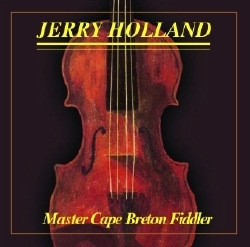 In 1982, when Jerry Holland recorded Master Cape Breton Fiddler, he set a new standard for the up and coming generation of Cape Breton fiddlers. Although long out of print, this classic album continues to influence the tradition, and today, many of the tunes remain popular standards throughout the world. Digitally remastered for the first time, this recording and accompanying booklet provide a glimpse of the flowering career of one of Cape Breton's finest fiddlers and composers. Tune listing. Dan R. MacDonald, a 20th century Cape Breton fiddler, is generally considered Cape Breton's greatest composer. William Marshall was 18th century Scotland's greatest. "Winston in the '50s" is Winston Fitzgerald's reel setting of a Niel Gow strathspey, "Miss Erskine of Torry." The first two tunes were heard from fiddler Mike MacDougall of Ingonish, Victoria County. Jerry adapted "Mrs. McGee" from the setting found The Glen Collection after his friend Willie Joe Chiasson of Cheticamp suggested it. The composer, John Riddell, was an 18th century blind fiddler from Ayr, Scotland. Jerry learned this medley from pianist Joan MacDonald Boes. Originally from Foot Cape, Inverness County, as a young woman Joan moved to the Detroit, Michigan area where she played with The Five MacDonald Fiddlers. "The Street Player" was learned from an LP of Andy McGann. The last two reels came from Irish tin whistle player Mary Bergin. "Cutting Ferns" is a popular Scottish strathspey which is often sung as a puirt a beul. "Alex Dan MacIsaac's" was learned from Dave MacIsaac. William Morrison was a 19th century Scottish composer. Popular tunes Jerry learned from Winston Fitzgerald and later played during his tenure with The Cape Breton Symphony. Many settings of the first and last reels are circulating in Irish sessions. In the '30s Paddy Killoran recorded "Carrigaline" as "The Steeplechase". The first tune is a popular traditional jig heard all over Cape Breton. The name "Mike MacDougall's" simply refers to Jerry's source. The last jig came from a house-tape of Donald Angus Beaton. Jerry associates these older Scottish book-tunes with Bill Lamey. The first two tunes were learned directly from Dave MacIsaac. Dan Hughie MacEachern was a fiddler and composer from Queensville, Cape Breton. Dave and Jerry are particularly fond of Dan Hughie's music. Many remember Little Jack MacDonald playing "The Beauties of the Ballroom". A popular melody in the 18th century, it first appeared in G minor as "The Lads of Leith." Later it was adapted to song by Robert Burns. The last two tunes come from the highland bagpipe repertoire. Many John MacColl tunes are circulating in Cape Breton. He was an early 20th century, highland piper from Scotland. One of his students, piper Sandy Boyd, immigrated to Cape Breton during the 1940s. Joey Beaton is a piano player from Mabou, Inverness County. He was the accompanist on Jerry's first LP.